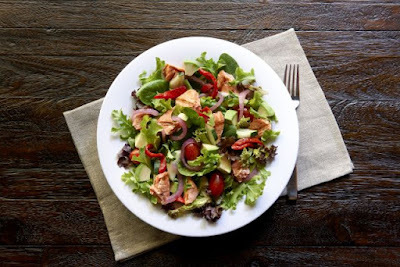 Jason's Deli and The University of Texas MD Anderson Cancer Center join forces to debut the new Salmon Pacifica Salad as a healthy option that also benefits cancer prevention research. The new salad clocks in at 450 calories and consists of wild-caught Alaska sockeye salmon on a bed of USDA-certified organic field greens, topped with fresh-chopped avocado, grape tomatoes, fire-roasted Piquillo peppers, cucumbers, pickled red onions, and a new house-made cucumber-dill vinaigrette. It was created by the chain jointly with MD Anderson dietitians and cancer researchers to meet the American Institute of Cancer Research and World Research Fund guidelines for cancer risk reduction. Through April 2018, 50 cents from the sale of each Salmon Pacifica Salad sold at participating locations will go to benefit cancer prevention research and programs at the MD Anderson Cancer Center.